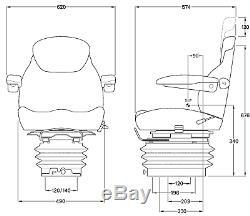 KAB 15/E6 12volt AIR SEAT. The 15/E6 is a mid-height back air suspension seat, suitable for applications where there is limited floor space in the cab. The suspension unit and seat top are compact to allow for maximum comfort and performance in the smallest of. For multiple seats, please call for available discounts 02476 610783. Air Suspension with small footprint. Fabric Trim - Square / Underground (as shown). We do not accept cheques or postal orders. Scottish Highlands & Isles IV1-36, 40-56, KA27-28, PH17-26, PH30-44, PH49-50, PA20-49 & 60-77, PA78, ZE1-3, HS1-9, KW1-3 & 5-17. Northern Ireland - All BT postcodes. Channel Islands, Isle of Man etc. Remember to provide a valid contact number (preferably a mobile) with your order details. All deliveries require a signature. We welcome you to collect from our warehouse but please call to arrange on 02476 610783. The item "KAB 15/E6 12volt Air Seat Caterpillar JCB Manitou Matbro Merlo Terex Telehandler" is in sale since Monday, April 23, 2018. This item is in the category "Business, Office & Industrial\Agriculture/Farming\Tractor Parts\Modern Tractor Parts & Accs". 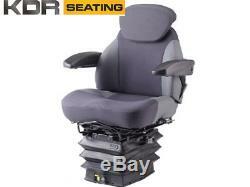 The seller is "kdrseating_online" and is located in Warwickshire. This item can be shipped to United Kingdom.